The Shilla Duty Free's Ambassadors, SHINee and Red Velvet were in town on 24th November 2017 to celebrate The Shilla Duty Free's newly opened Cosmetics & Perfume store at Singapore Changi Airport Terminal 4 (T4). The heart-throbbing idols visited Changi Airport Terminal 4 and met the media, answering questions on their personal beauty secrets before their scheduled appearance at Shilla Beauty Concert. During the press conference, Red Velvet members agreeing that Joy as the beauty Guru in their group. "I put on a cold mask every morning to reduce the swelling on my face," said Red Velvet's Joy. While Red Velvet's Seulgi said: "since we wear heavy makeup on stage, I take a lot of care in removing my makeup and cleansing my face." Not only Red Velvet, SHINee also shared their beauty tips for men. Key shared that one easy-to-go product for men nowadays is not just using the skincare products but more of using the BB and CC cream. 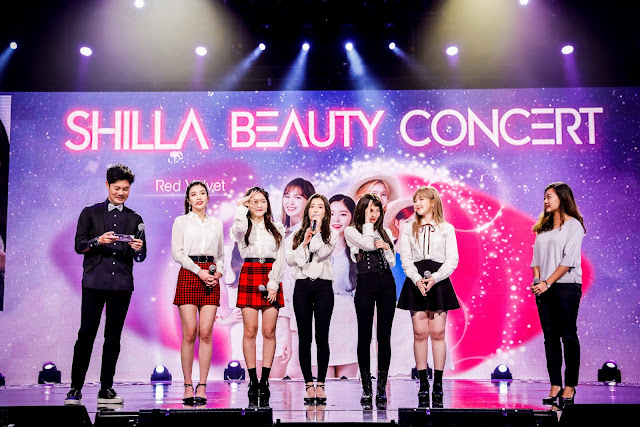 On the same day, SHINee and Red Velvet performed for Shilla Beauty Concert held especially for the valued fans and partners at Suntec Convention Centre. The talented special guest, Eddy Kim kick-started the night with his singles titled 'Apologise', '2 Years Apart', 'You're So Beautiful', 'Push and Pull' and 'The Manual'. 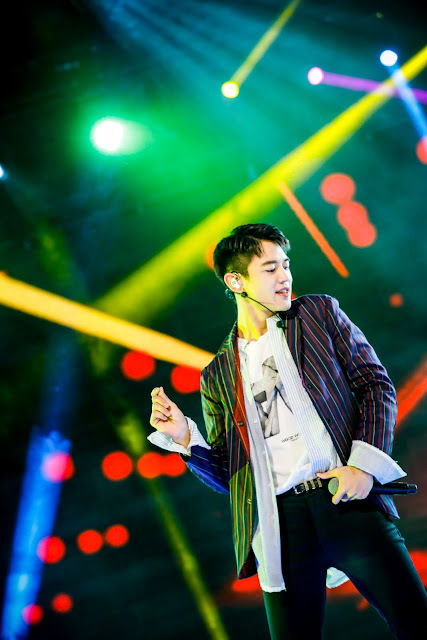 The charming star's soothing vocals and charisma on stage left all the girls falling for him when he sang his new song which he wrote during his army days. The production kept the audiences in suspense when a crew of dancers performed dance cover on both Red Velvet and SHINee's hit songs before their actual appearances. The crowd began to go wild when Red Velvet went on stage and performed their hit songs, 'Dumb Dumb', 'Russian Roulette', 'Rookie' and 'Red Flavor'. They kept their promise during the press conference and performed their latest comeback song, 'Peek-a-boo'. Each of the members was looking great in their newest hairstyles for their recent comeback and it was obvious that they have flawless bright skin. During the talk segment, Red Velvet mentioned that they felt happy getting to perform for the second time on the same stage in the Suntec Convention Hall. SHINee appeared last on stage taking the whole excitement to the next level. Fan chants were clearly heard when the charismatic members showcased their dance performances - 'View', 'Beautiful' and '1 of 1'. Coming to 10 years since their debut, SHINee never disappoints and truly gave their best for the night. 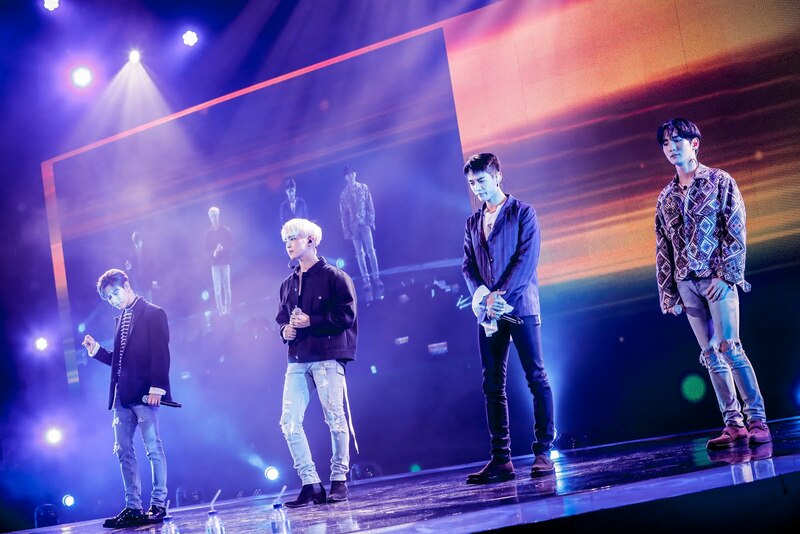 Their melodious stage left the audience in awe as the fans sang along their hits 'Don’t Let Me Go', 'Aside' and 'Encore' with the members showcasing their powerful vocals live. During the beauty talk Q&A, Taemin mentioned that putting on a smile and happiness are important for him to stay looking good. When being asked what are the must-have beauty products, Key then said a moisturizer cream and a spray mist are essential for his dry skin. The 2-hours concert ended with a WOW. 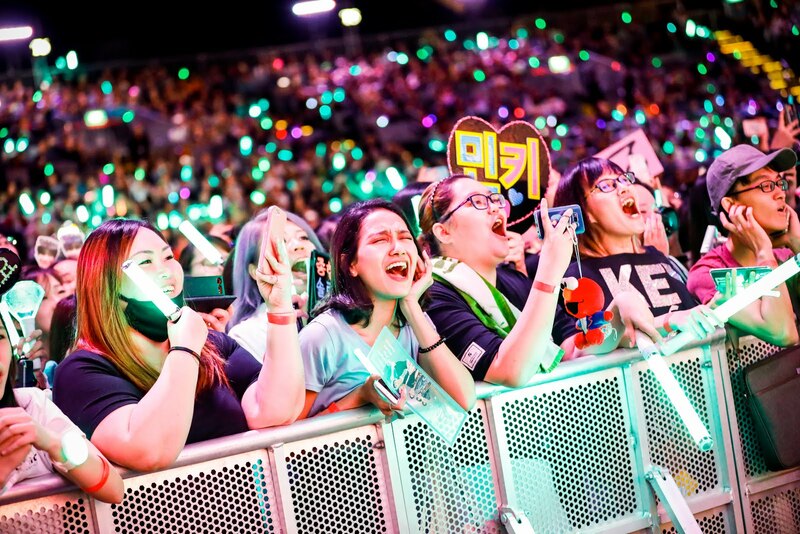 However, the audiences could not get enough of the idols' performances and chanted for an encore stage. ps: no worries as we bet the idols will return real soon to Singapore and have another amazing concert with the fans again! Not forget to mention that, you can now enjoy the seamless duty-free shopping at The Shilla Duty Free's newest store located at Changi Airport Terminal 4. Lastly, we would like to thank, The Shilla Duty Free for inviting us to the event.